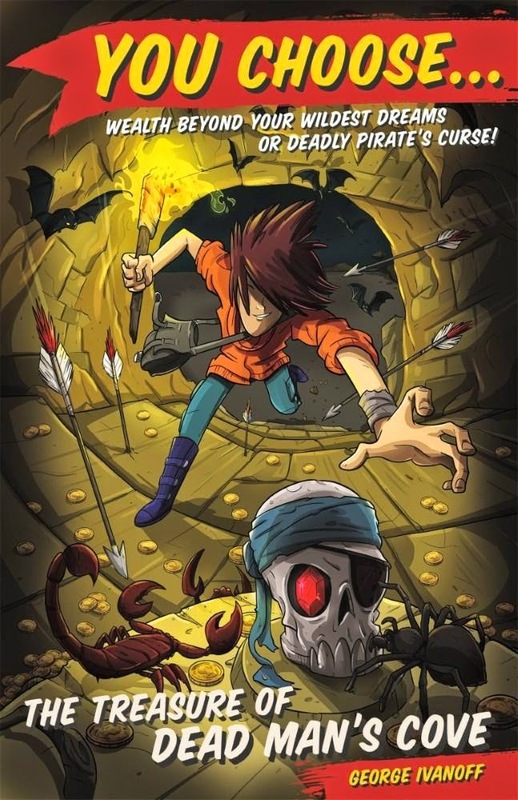 With its manga-inspired cover The Treasure of Dead Man’s Cove is the first book in this new series called YOU CHOOSE … aimed at boys seven years and up. In the vein of the Choose Your Own Adventure stories of the 80s (devoured by my chapter-book-shy sons), George Ivanoff is on to a winner with this latest addition to his 70+ children’s books. No. You’re going to have to go down that path yourself; I’m heading back to choose another scenario. Ivanoff has speckled the stories with interesting characters. Who could resist Professor Wagner with his ‘mismatched eyes – one small and squinty, the other wide and staring.’ In the museum there’s the ‘tall woman with spiky blonde hair’ who ‘looks as if she’s been sucking a lemon,’ and what’s a pirate story without a macaw named Mr Fibuli and a town mayor who speaks pirate-talk. Fun puns run amok in the town: Toys Argh Us, Long John’s Silverware and Shiver Me Timbers Hardware. There are numerous pathways for the reader to explore. Each path choice is about a page in length, which makes for quick, fun reading. The stories are totally plot driven and each page number is superimposed with skull and crossbones for added effect. With 19 endings, there are plenty of scenarios to follow. Will you discovery the secret stone, that when pressed, opens into a cavernous pirate graveyard filled with Indiana Jones-like booby traps? Can you escape fast enough not to be skewered by a spear? Black and white etchings of coins, treasure chests and maps smatter the pages as ‘you’ the reader make the decisions and take control of the storyline. The Treasure of Dead Man’s Cove is a swashbuckling start to the series.